Rocky Mountain Specialty Gear got its start in 1995. Back then, in Denver, if you wanted to buy a quality knife, backpack, or set of binoculars in person then you had to drive to the nearest Cabela's...in Sidney, Nebraska! For this reason RMSGear was started. We have become a niche store specializing in quality hunting products related to traditional archery. Since the shop's beginnings we have built one of the best knife shops in Denver, if not the best. We currently have over 450 bows in stock and most any other product you would need related to traditional archery. RMSGear is a family run Mom & Pop type of store with old fashioned customer service. The shop is ran by Tom Clum and his sons, Tommy and Danny. Tom has 40 years of traditional archery experience, and his two sons have been shooting stick bows since they were coordinated enough to hold one up. In this day and age a brick and mortar retail store devoted to traditional archery is rare. In the whole country there are only a handful, and among them only a small few are open to the public 6 days a week, 10 hours a day. The staff here is proud to serve the traditional archery community. It is their passion and they would do anything to help others get started in this wonderful sport. In 2015 we decided to jump into the compound world on a small scale, mainly so we can keep quality service as high as possible. We weren't willing to do it without the right guy, and we found him. Matt Hogue runs the RMSGear Pro Shop. Matt has the same kind of professionalism and dedication to personal service as RMSGear has been built on. Tom started RMSGear from the ground up. Thousands and thousands of arrows later he has been blessed with many true friendships and is fortunate to enjoy life in a great atmosphere every day. Tom has been bow hunting since 1976 and shooting a traditional bow since 1982. He has successfully hunted many species with the stick and string. Tommy is Tom's oldest son. Tommy graduated from the University of Wisconsin in 2006 and moved home a few years later to try and help this business. While in college Tommy was a 2X NCAA DI All-American wrestler. Tommy and his brother Dan have been terrorizing squirrels since they were old enough to pull a bow back. Their early squirrel hunting days were the beginning of a passion for both archery and bowhunting which still exists strong. Tom's youngest son, Dan, has grown up with a bow in his hand his entire life. Danny worked as a fly fishing guide in the summers while in college. Danny followed his older brother to college at the University of Wisconsin, where he also wrestled for the Badgers. He has a passion for bowhunting that rivals any. His knowledge and passion are a great fit at RMSGear, and part of what makes this place what it is. Paul has grown up shooting a trad bow his whole life. He is as experienced and knowledgeable as anybody his age. We are extremely excited to have Paul working for us full time. Paul has been bowhunting for his entire life and he brings a wealth of experience here with him. If you haven't met Paul, please come down to the store and introduce yourself. Matt has been a bowhunter since the age of 16. He cut his teeth hunting whitetail and turkey in Pennsylvania, where he grew up. Matt has been in Colorado since 1999 and working as a full-time bow-tech since 2004. Matt brings the professionalism and personal service that RMSGear has been built from. It doesn't matter if you need your peep adjusted or a complete bow tune, Matt will take great care of you. Tom's wife Chris has always had a passion for the outdoors. Chris loves to hunt with her husband and sons and has been hunting with a Wapiti Recurve for the past 25 years. Without Chris RMSGear would not exist. Missy and her husband, Ray, started as RMSGear customers. We needed to hire another employee to help with web duties and we got lucky that Missy was looking for a new job. Little did we know just how valuable she would be to our business. Missy has turned into an integral part of what we do. If you need anything done quick, Missy is your gal. 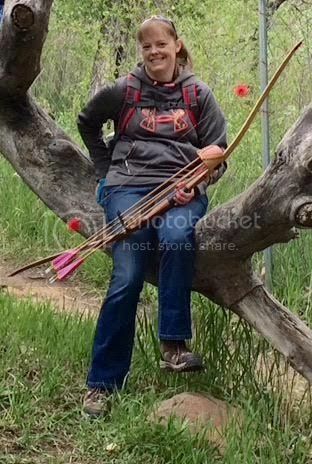 Tracy literally grew up with a life centered around traditional archery. Bob Gulliksen (his father) has one of the finest broadhead collections in the country. Tracy has taught all of our arrow makers the finer points of perfecting their skills. He is one of the top shooters in the region and is an accomplished bowhunter. When we have an order for a special set of arrows, Tracy is our man. He can be found at the shop most Saturdays.